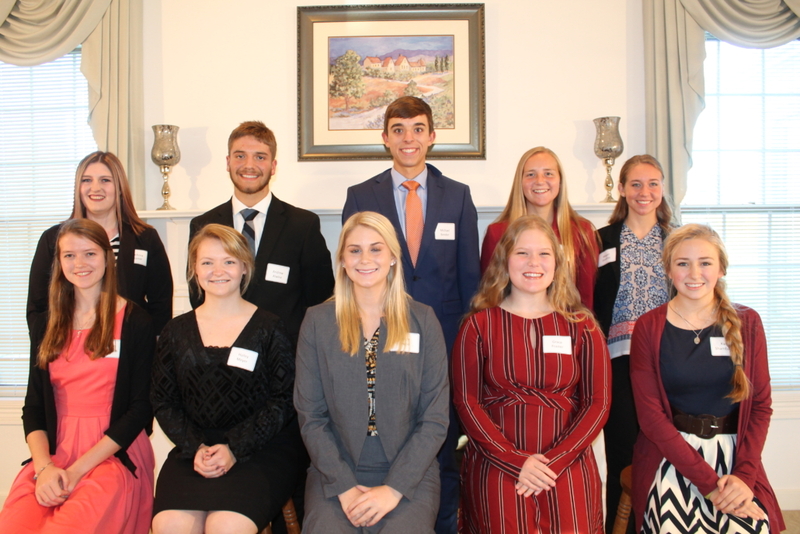 Ten Top Honor students were recently interviewed for Noble County’s Lilly Endowment Community Scholarship at the Community Foundation of Noble County. Selection of the students was based on their applications submitted in August to the community foundation which were reviewed by a panel of judges representing the central, east and west part of Noble County. The Lilly Endowment Community Scholarship provides four years of full-tuition and required fees awarded to one well-rounded high school senior who resides in Noble County, that will receive a diploma from an accredited Indiana high school by the end of June 2019, and will pursue a full-time baccalaureate course of study at an accredited public or private college or university in Indiana. Community Foundation of Noble County also requires community/volunteer service, extra-curricular activities, leadership roles and honors and awards and at least a 3.80 high school grade point average. Andrew Alwine, East Noble High School, Michael Bender, East Noble High School, Grace Erwin, East Noble High School, Grace Frazier, East Noble High School, Megan Godfrey, West Noble High School, BreAnna Hunter, West Noble High School, Hailey Meyer, East Noble High School, Alyson Robinson, Central Noble Jr/Senior High School, Katie Shambaugh, Churubusco Jr/Sr High School, Jamie Zeigler, Churubusco Jr/Sr High School. Names of the top candidate and two alternates will be submitted for final selection to Independent Colleges of Indiana Inc. ICI is a nonprofit organization that represents 30 regionally accredited, degree-granting, nonprofit, private colleges and universities in the state. The Lilly Endowment Community Scholarships are the result of a statewide Lilly Endowment initiative to help Hoosier students reach higher levels of education, according to the community foundation. Indiana ranks among the lowest states in the percentage of residents over the age of 25 with a bachelor’s degree. A total of 143 Lilly scholarships are awarded statewide. The primary purposes of the Lilly Endowment Community Scholarship Program are 1) to help raise the level of educational attainment in Indiana; 2) to increase awareness of the beneficial roles Indiana community foundations can play in their communities; and 3) to encourage and support the efforts of current and past Lilly Endowment Community Scholars to engage with each other and with Indiana business, governmental, educational, nonprofit and civic leaders to improve the quality of life in Indiana generally and in local communities throughout the state. The Noble County recipient of the Lilly Endowment Community Scholarship will be announced in early December 2018. Other finalists for the Lilly Endowment Community Scholarship will receive a $1,000 scholarship from the Community Foundation of Noble County. Pictured seated from left are: Alyson Robinson, Hailey Meyer, Grace Erwin, Grace Frazier, and Katie Shambuagh. Standing are: BreAnna Hunter, Andrew Alwine, Michael Bender, Jamie Zeigler, and Megan Godfrey. Provide your clients with solid advice on charitable giving.